Find the highest and lowest performers in Texas. Learn why nearly 500 campuses failed to meet minimum standards — and how the state inflated the rankings in the top category. In the spirit of year-end reflection, we've put together two searchable databases of the best and worst schools in Texas, as judged by the state accountability system. "Best" and "worst," of course, oversimplifies what goes on in schools and how they should be judged. Often, such labels reflect more about the needs and socio-economic makeup of the schools' enrollments than they do about the quality of their faculties. (The state prefers slightly softer and more bureaucratic labels: "academically unacceptable" and "exemplary"). But test scores, on which the rankings are primarily based, no doubt provide one important barometer of school quality. Our worst schools database allows you to search by individual school name, district, and the particular failings that earned the school a spot on the state list. The 499 schools it contains are those the Texas Education Agency has judged so inferior that their districts must allow students to transfer to better schools, either within the district or in another one. In practice, however, that almost never happens, as we explained in a recent story. 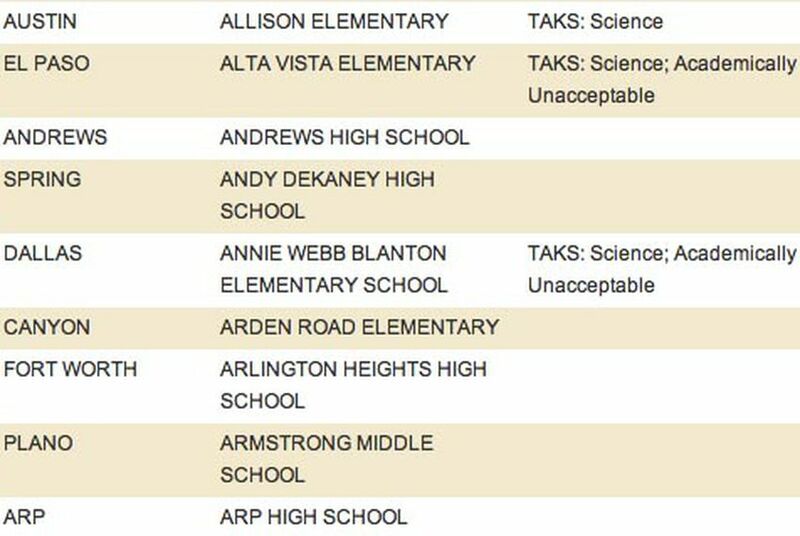 A school gets on the list in two ways: half or fewer of students pass any particular subject area on the TAKS test, in any of the two previous years; or the school was rated "Academically Unacceptable," based on test scores and dropout rate, in any one of the three years. See more detailed explanation from TEA. When schools missed the mark in particular subjects, it overwhelming happened in science, math, or both. That's why our database, in allowing you to sort schools by subject-area deficiencies, includes only those two subject areas. The number of schools cited for too many test failures in other subjects, including reading, writing and social studies, was so small as to be hardly worth noting. At the same time, many schools that struggled to get out of the academically acceptable category were hurt by new and tougher rules on how schools count dropouts, a notoriously slippery process. These two data apps represent our first foray into the world of education data — but hardly the last. Soon, we'll be putting together a comprehensive application that will aggregate a host of information on student achievement, dropout rates, school finance, political leadership and anything else we can put our greedy hands on to help you find your children the right school — and to hold politicians accountable for providing Texas children the quality education they deserve.